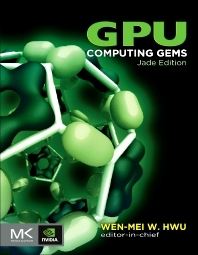 GPU Computing Gems, Jade Edition, offers hands-on, proven techniques for general purpose GPU programming based on the successful application experiences of leading researchers and developers. One of few resources available that distills the best practices of the community of CUDA programmers, this second edition contains 100% new material of interest across industry, including finance, medicine, imaging, engineering, gaming, environmental science, and green computing. It covers new tools and frameworks for productive GPU computing application development and provides immediate benefit to researchers developing improved programming environments for GPUs. Divided into five sections, this book explains how GPU execution is achieved with algorithm implementation techniques and approaches to data structure layout. More specifically, it considers three general requirements: high level of parallelism, coherent memory access by threads within warps, and coherent control flow within warps. Chapters explore topics such as accelerating database searches; how to leverage the Fermi GPU architecture to further accelerate prefix operations; and GPU implementation of hash tables. There are also discussions on the state of GPU computing in interactive physics and artificial intelligence; programming tools and techniques for GPU computing; and the edge and node parallelism approach for computing graph centrality metrics. In addition, the book proposes an alternative approach that balances computation regardless of node degree variance. Software engineers, programmers, hardware engineers, and advanced students will find this book extremely usefull. For useful source codes discussed throughout the book, the editors invite readers to the following website: <a href="http://gpugems.hwu-server2.crhc.illinois.edu</a>…"
It wasn't until recently that parallel [GPU] computing made people realize that there are whole areas in computing science that we can tackle. … When you can do something 10 or 100 times faster, something magical happens and you can do something completely different. Wen-mei W. Hwu is a Professor and holds the Sanders-AMD Endowed Chair in the Department of Electrical and Computer Engineering, University of Illinois at Urbana-Champaign. His research interests are in the area of architecture, implementation, compilation, and algorithms for parallel computing. He is the chief scientist of Parallel Computing Institute and director of the IMPACT research group (www.impact.crhc.illinois.edu). He is a co-founder and CTO of MulticoreWare. For his contributions in research and teaching, he received the ACM SigArch Maurice Wilkes Award, the ACM Grace Murray Hopper Award, the Tau Beta Pi Daniel C. Drucker Eminent Faculty Award, the ISCA Influential Paper Award, the IEEE Computer Society B. R. Rau Award and the Distinguished Alumni Award in Computer Science of the University of California, Berkeley. He is a fellow of IEEE and ACM. He directs the UIUC CUDA Center of Excellence and serves as one of the principal investigators of the NSF Blue Waters Petascale computer project. Dr. Hwu received his Ph.D. degree in Computer Science from the University of California, Berkeley.